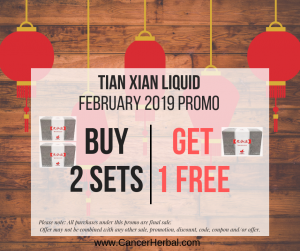 For the month of February 2019, purchase 2 sets (120 vials x 20ml) of Tian Xian Liquid or 2 sets (120 vials x 20ml) of Super Tian Xian Liquid in a single order to avail 1 set (60 vials x 20 ml) of the same for free. The free 1 set (60 vials x 20 ml) is manually processed, it will not reflect on the online summary. A separate email confirmation will be sent reflecting the free item. This promo may not be combined with any other sale, promotion, discount, code, coupon and/or offer. All purchases under this promo are final sale and not eligible for returns or exchange. 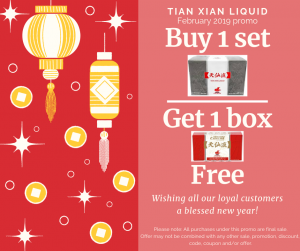 For the month of February 2019, purchase 1 set (60 vials x 20 ml) of Tian Xian Liquid to avail 1 box (20 vials x 20 ml) of the same for free. The free 1 box (20 vials x 20 ml) is manually processed, it will not reflect on the online summary. A separate email confirmation will be sent reflecting the free item.